On sale at the Emporium will be a wide array of great quality folk horror merchandise. books and art. Plenty of choice for Yule treats for the special folk in your life or for yourself, so bring along a few extra pennies in anticipation of tempting, quality and fairly-priced special things. Eolith Designs showcases the talents of Kt’s husband Cobweb. Cobweb lives in a little house at the edge of the world with his wife Kt and their cats Sekhmet and Baal. He claims to have been sculpting and painting for as long as he can remember, but it’s been longer than that. In recent years he has devoted himself more and more to sculpture based around mythical and historical themes many of which can be found at www.eolithdesigns.co.uk. In his spare time he paints things he wishes he hadn’t seen, and pokes dead religions with sticks. He’s currently in the early stages of a new project called “Beyond the fields we know”, inspired by the landscape and folklore of the North Pennines. This will include 2D and 3D work and a lot of being very cold in the middle of nowhere seeing things he wishes he wasn’t seeing. Once again Krampus will appear in Whitby for Whitby Krampus Run III. will wend it’s way down Church Street collecting for Whitby Wildlife Sanctuary. history and wintry figures alongside our Krampus, Perchten and St. Nicholas. back to the ideal setting of Whitby’s quaint and cobbled streets turning the East side into Krampus Town. The parade finishes with a finale letting you decide who will be crowned ‘ The Thing of The North ‘. This year Whitby Krampus Run is now a public event with approval of the necessary authorities and support from Tourism. We’ve got a street collection licence for Whitby Wildlife Sanctuary as this event is a fundraiser for one of our favourite local charities. There’s evening entertainment with the usual activities such as raffles associated with fundraisers. Sponsored visits can be arranged. There’s t shirts, flags art and merchandise to help fund the event and a Yule art show from 9th December at Stuart Ducketts shop on Skinner Street. December 5th the Saint visits homes and gives gifts to good children. He is accompanied by his dark counterpart the Krampus who teases and punishes naughty children. which was very well received ( even by naughty children ). People from a variety of backgrounds have taken part in previous years including family groups and their children. The interpretation of the event has been planned taking into account a UK audience unfamiliar with the story. Although potentially a scary figure children do encounter him comfortably with support of parents. Never forget St. Nicholas is always in charge of the Wild Things. Similar themes run through fairytales, legends and stories loved by families. from 3.30pm until 6.00pm although costumed characters may be in the area before and after the parade. Do you see shadows in the mist? Are you stalked by meadow hags? Do you long to play with black stars? Do you crave a darker yule? Then this book could be for you! It is Christmas on the North York Moors. The snow sits upon the heather and bramble. The fences around RAF Fylingdales are silent and still. A dense mist grows in the distance. If you listen closely you can hear strange Yuletide chants, the hum of a land sphere and the cackle of a meadow hag. 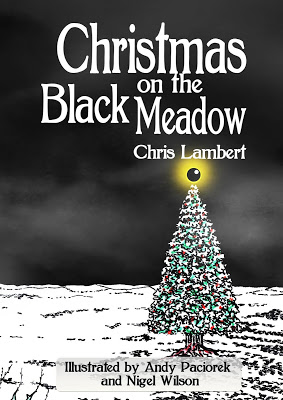 This collection of Christmas tales from the Black Meadow contains three new Yuletide stories. Experience a beautiful inversion of The Nativity in A Black Meadow Christmas, warm your toes in a tale of matriarchal terror in The Meadow Tree and marvel at the delightful wonders of The Black Star. You will also find details of ideal gifts you could give and games that you can play when visiting the Black Meadow. With beautiful illustrations by Andy Paciorek and Nigel Wilson, this is a festive treat that will bring joy and fear in equal measure to your Christmas celebrations. All profits from the sale of this book go to Worldwide Cancer Research.